The “liberal world order” created by the United States after the Second World War is an historical anomaly that may be coming to an end, according to the Brookings Institution’s Robert Kagan in his new book The Jungle Grows Back. Kagan views authoritarianism as a greater threat to the survival of democracy than communism because in his view an unenlightened authoritarianism is more consistent with human nature. The United States and the countries of Western Europe, he writes, are retreating to nationalism and tribalism while moving away from the enlightened universalism that has supported the liberal world order since 1945. He criticizes the foreign policy “restraint” of the Obama administration and the “America First” foreign policy of the Trump administration, yet he acknowledges that both appeal to many Americans who yearn to be a “normal” country and who recoil from being the world’s policeman. For Kagan and some other neoconservatives, the end of the Cold War changed nothing. America’s global responsibilities remain the same, albeit with different adversaries and more diffuse threats. Those who today counsel restraint, Kagan warns, risk repeating the errors of the 1930s and the 1970s when America’s timidity enabled geopolitical threats to grow. Kagan worries that as American power wanes in Europe and East Asia, the transformation of the global power structure accomplished by the creative statesmanship of the immediate post-World War II period will end. European geopolitics may return with a vengeance, while East Asian geopolitics will intensify. He even raises the specter of nationalistic Germany and Japan once more acting assertively on the world stage. Although Kagan decries the “new realism” that emphasizes the limits of American power, it was, ironically, the success of Kagan’s worldview as practiced by the George W. Bush administration that produced the political environment for a more restrained American foreign policy. The seemingly endless war in Afghanistan and the unsuccessful war in Iraq—waged to implant democratic values and practices in regions inhospitable to democracy—demonstrated for those not blinded by hubris the limits of American power. Those presidents succeeded by husbanding and deftly wielding American economic and military power to support American interests, not by dispatching American troops willy nilly to spread democracy or transform the world. America, John Quincy Adams said, is the well-wisher of freedom to all but the champion and guarantor only of her own. 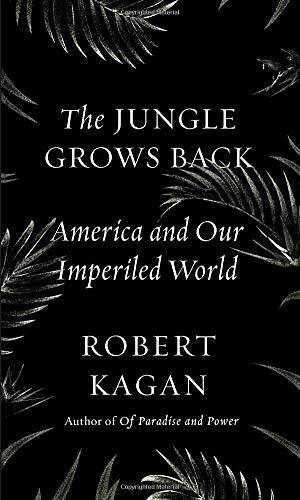 While Kagan’s worldview contains some elements of Wilsonianism, he also writes persuasively about some eternal truths of international relations that should inform any U.S. administration’s approach to the world. He understands that it is American military predominance, not “soft” or “smart” power, that ultimately supports the U.S.-led world order. He realizes that the struggle for power is a permanent feature of international relations. He has a pessimistic view of human nature and notes that policy choices are frequently limited to bad and worse options. He knows that there are no permanent solutions to foreign policy problems and that containing or keeping a lid on trouble is often the best we can do. He recognizes that a rising China poses the greatest geopolitical challenge to the United States in the early 21st century.